In an article I published back in April 2009, imaginatively entitled GTD For Web Project Management, I explained the very basics of David Allen’s amazing productivity methodology / cult called Getting Things Done, or as followers call it, GTD. If you haven’t read that article yet, or heard of GTD, I suggest you do so, so that this one makes a little sense. 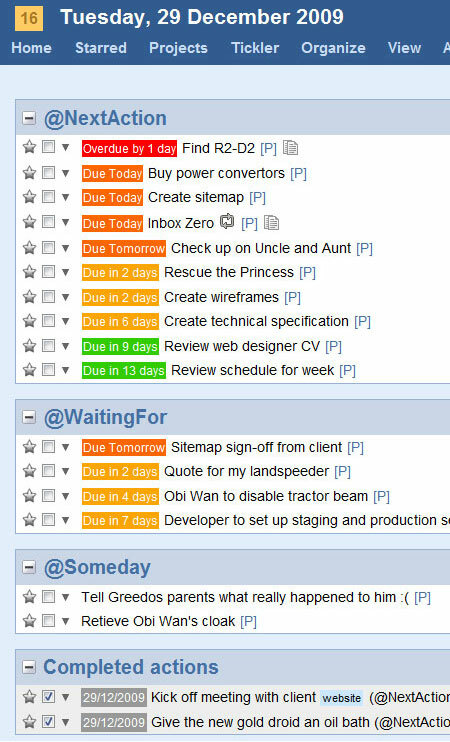 Next Actions, Waiting For and Someday are simply categories, or ‘contexts’ as per GTD terminology, that I arrange all my workload tasks in so that I have absolutely everything I need to do in one central place. It doesn’t matter if it’s a small internal task my MD asked me to do, a critical decision I’m waiting for from a client or a project schedule I need to put together – everything is immediately captured in the To Do list and the right context. As I complete a task I will mark it as Completed and then perhaps add a Waiting For, for example, if I send a first version functional specification to Client Y, after hitting send I’ll create a Waiting For item called “Get feedback on first version of Functional Specification from Client Y”. Many people are good at keeping To Do lists, but few keep track of things they’re waiting for. Instead they keep this information in their head, which means their mind is always working when it could be resting. Inbox Zero simply means processing all e-mails in your Inbox so that you’ve deleted, stored or captured any actions you need to in order to have that magical number of zero e-mails in your Inbox. Aside from the psychological benefits this brings, achieving Inbox Zero also means you have succeeded in getting your whole task list into one centralised place and can now process any new e-mails that arrive very quickly. In essence, GTD is all about giving you a productive way to work that puts focus on getting all your tasks captured in one place, a system to get through those tasks and all while keeping you as stress free as possible by having nothing inside your head – a natural state for Jeremy Kyle addicts. As I always state, I only use a very small portion of the full on GTD system, but it works for me. Well, my search could be over. Introduced to me by Branden Faulls of Clockwork Robot, I initially got a colleague to setup a version of Tracks, an open-source Ruby on Rails tool, on my VPS and began to use it – it was perfect, except for one thing, it kept crashing my VPS – my heart was broken. But then suddenly, in a last act of desperation I Googled and found a free hosted Tracks solution called GTDify – my heart was mended and for the last six months I’ve been happily using GTDify – I’m so happy with it I thought it was worth sharing. So why do I love GTDify and Tracks so much? I love GTDify simply because it allows me to have a free hosted version of Tracks that never falls over on a n00b (me) VPS. Reading that list I’m sure many of you are thinking of tools you know of that satisfy all these requirements, but I’d bet you a million squids that I’ve not only heard of them all, but tested each and every one. Please leave the names of tools you thought of in the comments! They all seemed to do 70% of what I wanted, but never everything, and if they did most of what I wanted, the user experience was poor and managing tasks became a chore rather than the effortless exercise it should be. It’s quite difficult to explain why I love using Tracks so much, but perhaps by showing you a few features it’ll become clear. Unless you’re a Ruby freak and can download, install and configure a copy of Tracks on a server, get yourself over to GTDify and sign-up for a free account. Once you’ve got your account and logged into your hosted version of Tracks, start by avoiding the temptation to vomit and the laugh at me for having the nerve to suggest a tool to you that looks so basic – don’t be fooled! The user interface isn’t stunning or glossy, but as you’ll learn if you give it a chance, it’s highly functional and intuitive, to the point where you don’t have to think when using it – perfect. In this section I’ll go through my typical Tracks / GTDify setup steps so you can get a feel for the app. Not the nicest preferences screen you’ll interact with, but it has the options I need and is generally a ‘visit once only’ part of Tracks and GTDify so screw it. The GTDify Preferences screen, a mere blip. Next create the Contexts you want. Personally I go for only three. GTD purists will probably use a more Contexts than me, including ones that allow them to process work by, well, ummm context, for example @E-mail, @Phone and @Office etc. If it works for you, go for it. 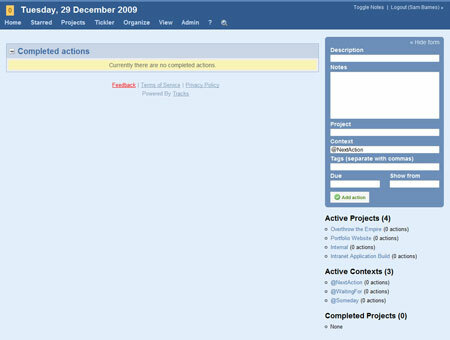 Tracks and GTDify allows you to create Projects in two ways; using the Projects tab, or defining a new project when creating a Task – happy days. 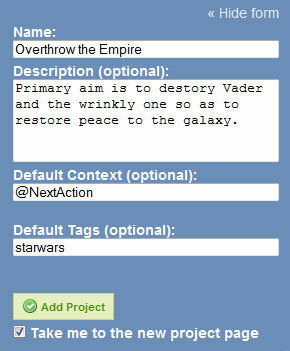 So that’s it, a quick setup and you’re ready to start adding tasks. To me, adding tasks, more importantly how quick and easy it is to add tasks is a critical success factor of any GTD tool; if it takes longer than a few seconds or requires any more than a couple of brain cells then chances are the tool won’t work. As you can see from the screenshot, Tracks provides you with an intuitive live suggestion or UI element for each field, thus making adding a task a breeze. And that’s it, Next Action added. Once you’ve added all your tasks you’ll begin to use Tracks as it was intended and the dashboard will be your new favourite screen. If there’s one thing, other than a little UI polish, that would make Tracks the ultimate solution in my opinion, it’s an iPhone App. Currently there is a mobile stylesheet, but as with most, it’s not great. 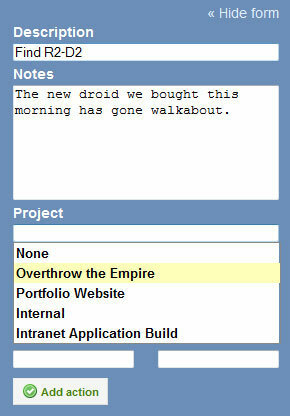 It does allow you to review and manage your task list on the go, but its slow going and not something I use very often. Tracks also comes with a reporting system that is collecting data from the minute you start using it. Although I haven’t found much use for it, boy does it look cool! Hopefully, if like me you’re just looking for a nice web based GTD tool that does the simple things well, this review will encourage you to try Tracks and GTDify. It works amazingly well for me and just maybe it will for you too. But I’m curious, what’s your To Do list tool of choice? Have you used intervals? http://Www.myintervals.com. It is what I use to run our agency and (mostly) worksfor us. I’d be interested to hear your review of it as a GTD tool. I’d love to go back and re-read your original article with this new context but it seems your link somehow resolves to the new one. A WP glitch? Being a bit of a lover of GTD myself I have always been looking at different tools to help. Right now I run things on both my mac and iPhone to keep tasks in but it’s hard. I sometimes find myself once again using my Inbox as a task manager which is a bad sign of trouble. Some days I don’t open up Things and so they get lost and as an iPhone app it’s not the best either. I’m going to give this one a go Sam and I’ll let you kow my thoughts on it. Far too many apps are overly complex for my needs and not very good at anything, this is looking good so far. My GTD process currently involves an a4 note pad and a blue bic biro. Every morning I copy over tasks that were not completed the previous day. This refreshes the mind on want needs to be done and to certain extent the sub-conscious prioritises the list. However, on occasion (especially low priority tasks) it has let me down. If it is not on the list, it disappears into the PM ether. I am going to give GTDify a trial starting tomorrow morning. Very exciting it looks. Thanks for the article Sam. GTDify looks good – I’m a fan of GTD so I’ll have to check it out. I’d like to know if you tested MonkeyGTD and your opinion about it, in a comparison with GTDify. I think it’s hard to find some simpler than that. Would you mind taking a look? And I’d like to try GTDify but links to it are broken!!! Any tip? @Rob Smith, hope you’re still using Tracks Rob! @Aaron, I’ve tried Thymer before. I found the interface a little clunky. @Ben, defintely try to ditch the pen and paper in my opinion. It works, but there’s nothing like being able to access your list from anywhere. And I dont know about you, but my To Do list is pretty big! @Geraldo, I’ve no heard of MonkeyGTD, will take a look! But the GTDify links seemed to be working when I tried them. @Dan, I have tried GTDAgenda and thought it was ok. Very similar to Tracks / GTDify in places, but with a slightly less polished UI. However I did love the Checklists feature! I finally found GTDify and I’m trying it, but still think MonkeyGTD is simpler. Although if there’s no MonkeyGTD I’d use GTDify for sure. It’s pretty good! It only fails to help on project’s next actions streams, that mGTD do so good. Try it! THANK YOU! At last a proper tool to organise things. Beats using an ever-expanding, disorganised notepad doc. Keep up the awesome work Sam. @Geraldo, I sure will take a look. 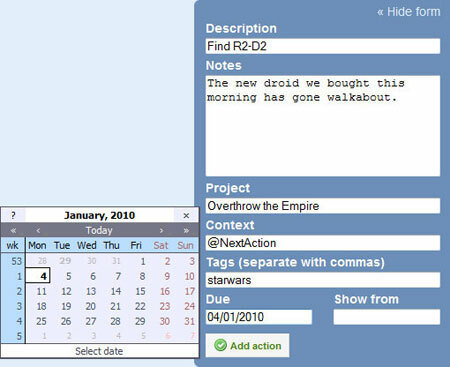 Hi Sam, Have you ever come across a tool that allows you to track tasks you have assigned to others? I find that I assign a lot of tasks to other members of the team and I want to see their progress without having to keep pestering them for updates. It would be great if GTDify had a team view! @David, I havent no, the only thing I try to do is get others using GTD! When successful its nice to hear after Ive given out a task it moves from my @NextAction to @WaitingFor, and they create a @NextAction item. Dude, v. impressed, trying it out now for my non-work stuff. I like your constant StarWars references, makes perfect sense especially for people like me, who watched StarWars every night until the tape heads wore the VHS out. Old school. @Myles, hope it works as well for you as it does me! And Star Wars all the way, nothing else is worth referencing – but kudos for being specific about VHS… my era, true old school. This article was both informative and hilarious (Star Wars references are awesome)! I was in the airport one day waiting for a flight when I came across David Allen’s book and took a punt on it! It wasn’t a bad decision at all. Much like yourself I take those elements from it that I feel work best for me and apply them to my daily routine as I see fit. Inbox Zero is a big priority of mine and the first portion of everyday is spent emptying it. I stopped using ‘flavour of the month’ GTD apps a long time ago as I found them to be a constant nuisance to use – which goes against the core of GTD. However I am going to give GTDify a try this week to see how I get on. Just out of curiosity how do you align your GTD stuff with your project management techniques? For example when you establish the requirements of your project during the discovery phase (or whatever phrase you use to describe this yourself) and build your Gantt chart do you then move to your GTD tool and start to track things solely using GTDify as you go? 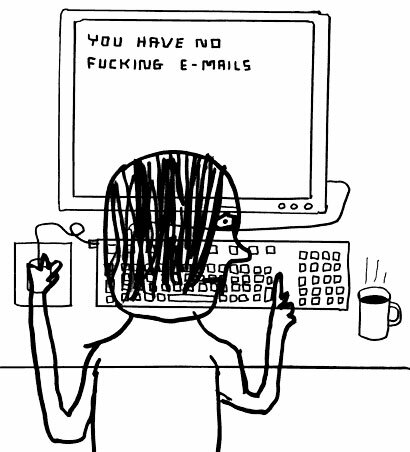 I’m also curious about your inbox zero organisational structure. If you have folders for projects how then do you keep track of non project items for clients (such as your digital account management items)? Thanks for writing this up. Gave me some good tips! My main issue now is how to synch my personal todo list with todos on other systems that I share with other team members, like items in a Basecamp todo list for example. 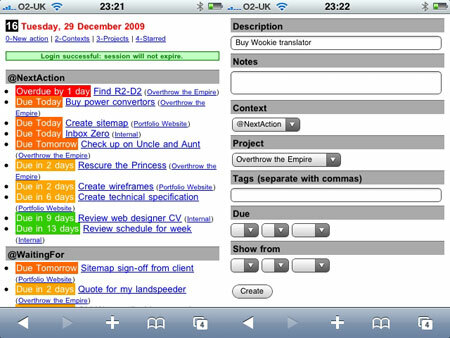 @Farez, I have tried Remember the Milk and though the features were nice but the interfacem especially the web one, was a little ugly and not nice to use. As for syncing To Dos… I’ve not heard of anything that does this natively but with all these systems having APIs it must be possible. I’m still just replicating To Dos in my Tracks list, but not all of my project to dos, just what I have to do next, or maybe the next two. Just started to use tracks and I found a very nice android app that syncs with tracks called shuffle. @thesambarnes Thanks for the tip. ahhhh! just fell off the GTD wagon. Project went nuts last week or two, and been doing 60 hour weeks and inbox zero is out the window and so’s most of the rest of GTD! How do I get back on? When you gonna answer Gareth’s post? 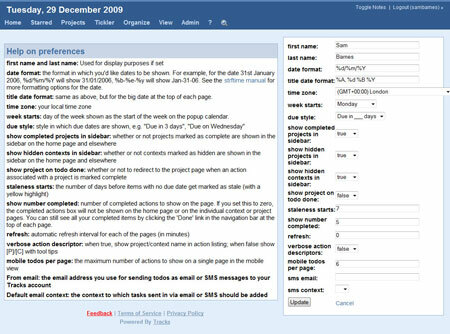 Gareth, for my part I would only bring things into GTD from the Gantt chart when they commenced. A bit like bringing tasks into a sprint iteration on agile I guess, but more flexible as I did this as and when. Sod it, this post has given me enough spur to bet GTDifying again. It served me well, and I’ll just have to give up my extended angry-birds loo-breaks during the day. p.s. @Sam nice offices at Volume… still a poor second to where I’m currently at! Boy will I get withdrawal symptoms when the contract ends! @Myles, good shout on replying to Gareth, missed him doh! Getting back on the GTD wagon after having a mad week or two… I’ve only ever found one thing to work, to spend an evening (usually a Sunday for me) sorting things out, processing the Inbox to zero while capturing everything I need to, plus updating my NextActions and WaitingFors. @Gareth, ahhh Gareth… big apologies! Forgive me :) As it’s been a while, did you give GTDify a try? What did you think, you still with it? Ok, to GTD and project management – using your example, once I’ve got the stage where I have a decent Gantt chart I’ll simply add the next 3-4 things I need or am waiting for in order to keep the project on track. 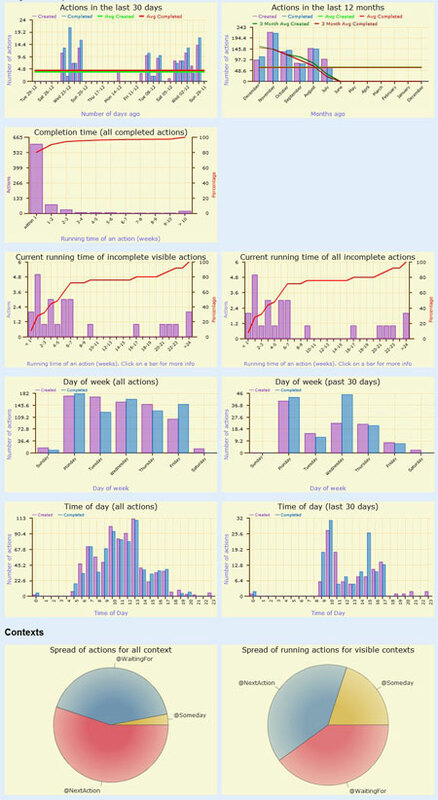 It defintely isnt some kind of disciplined connection between the two, GTD simply helps me keep in mind what the immediate goals are and when for – the dates being the important connection between the schedule and my tool – but yes, once the schedule is in place, I’ll use GTDify to keep track of my workload and update the schedule as and when something finishes earlier or later than intended. As for Inbox management, I have exactly that, folders for clients, then a sub-folder for project, and maybe further sub-folders if a topic could be a big one. As for non-project items, I’ll simply have a folder under the same client but call it something like Account Management, and underneath that I’ll have General and then folders with titles that represent a job that has many e-mails. If a mail conversation turns into a job or topic in it’s own right, I’ll retrospectively create a folder with a descriptive name and drag all the relevant mails to it. The trouble with explaining the method is it sounds so time consuming and complicated, but once you get into the habit it really is second nature and you really feel the benefits! Sam, I have been using Tracks on Gtdify and Shuffle on my Android for several months now. BUT the problem is it is getting slower and slower. Do you experience the same difficulties or do you have any idea on how to improve the situation? @tracks user, since the guys at GTDify had server issues and migrated to new servers I too have notice performance dropping a lot, especially since the migration – however, clicking on things today seems to be very snappy indeed, faster the before – I’m hoping it was just typical teething issues on the new environment. Let me know what you think. If it goes slow again I’ll probably mail the guys at GTDify to see what the deal is. I just found your site as I was googling for GTD and web projects. Great stuff here.I’ ve signed up for GTDify and I like it especially the interface and the ability to create different Contexts.What I’ m missing is a reminder of the intended outcomes and the actions required. Is there a way to create reminders? I also have a lifetick account for managing my goals.The reminder feature makes it easier to use it as a GTD Tool. Please let me know whether you have tried Lifetick as a GTD tool. @Douglas, thanks for your comments. I don’t think there is a reminder feature in Tracks unfortunately but I can certainely see how it would be a useful one! As for Lifetick, I’ve not used it before but will give it a little go as the UI looks really nice. Sam, I wish you a happy new year and hope to read more good stuff from you.Thanks for the tip with the the Google calendar. I will give it a try this year. Great review, except gtdify is unreliable. The calendar has been down for over two weeks now. http://my.gtdify.com/calendar. Emails to webmaster@gtdify.com receive no response. Also as you can see from netcraft here: http://uptime.netcraft.com/up/graph?site=my.gtdify.com the webhost is using WEBrick which is not designed for a production level load (it is only for development). Bummer, I’m still looking for a good tracks host, haven’t found one yet, even when offering to pay monthly! @Kevin, thanks for the comments and I’ve not had any issues recently with GTDify but since their recent server migration there have been a few days of downtime in the last few months for sure… not a terrible record but it really screwed a couple of my days up as I’m so reliant on it – perhaps a flaw of my own. However, in these downtimes I too searched for any other providers and found the following page – not sure these are any more or less reliable, but there are options. thanks, I’m migrating to tracks.tra.in, and supporting them financially to help with their hosting costs. their tracks instance is blazing fast! hopefully it’s reliable. Kevin, am interested to know how you got your migration going. Does tracks@gtdify got any export? and does Tracks@ .tra.in got import function? @Tracks user, GTDify does have an export feature (as does any installation of Tracks), but I’m yet to see an import capability… I would certainly like one so I could backup my entire lists in two places! @Cynical, thanks for that, I’m sure it will help someone out there! We use Dooster and like it lots. We have had it for a couple of months. The customer service is excellent. @Christine, I had a look at Dooster after your comment and it looks very ‘samey’ – what would you say are it’s stand out features that you believe separate it from others in this arena? At Bitnami there are downloads for different kinds of TRACKS usage installers. One can chose between local windows, linux or Mac install, a virtual machine and a instant cloud solution. If you you want to try and use more of there applications it is wise to install the RubyStack first, and after that an application module. @Arie, wow thanks, this could be very useful indeed!! !